ENVI-Clean™ technology has now been demonstrated to achieve high SO² removal efficiencies (>99%) under real-world conditions. 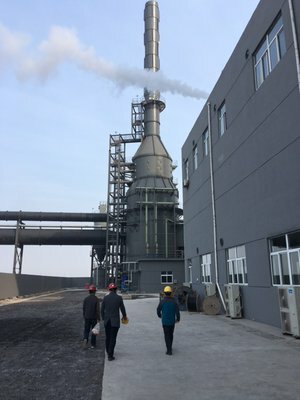 The ENVI-Clean™ Flue Gas Desulphurization (FGD) system installed for the Lianxin Steel Group at their facility near Yancheng in China is designed to remove sulphur dioxide (SO²) from the new power boiler exhaust. The boiler uses blast furnace gas and coke oven gas as fuel (previously they were flared) to produce steam that powers a turbine to generate 93 MW of electricity. The exhaust gas from the boiler contains up to 250 mg/m3 of SO² that the FGD system is designed to remove. The FGD system is based on a 10m (32ft) diameter 28m (91ft) tall absorber vessel. This uses a slurry that has limestone in a froth produced by PGT’s patented head technology to capture the SO² by absorption. The limestone neutralizes the acids that result from SO² reacting with water to form gypsum as precipitated solids. The gypsum is removed on a continuous basis by pumping slurry from the absorber reservoir to hydrocyclones to concentrate the solids. Then, a vacuum-belt filter produces a gypsum cake. This can then be landfilled or sold.